Portable oxygen solutions are ideal for patients requiring oxygen therapy, but who still want to be able to live active, healthy lives. While different types of oxygen therapy are often necessary for anyone living with a lung condition, a portable oxygen concentrator for breathing can help you fit the therapy more easily into your life. 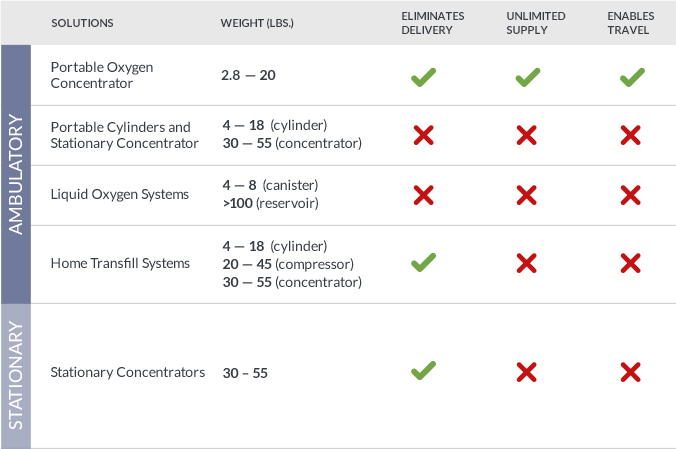 Stationary oxygen concentrators require you to stay in one place for supplemental oxygen, while portable oxygen solutions using tanks, liquid systems and home transfill systems require refills and heavy canisters or cylinders. None of these options are ideal for someone wanting to be able to travel easily and without worry. A POC, on the other hand, is the portable oxygen solution made for people who want to retain their mobility, freedom and independence. Because POC oxygen is pulled directly from the atmosphere, it never runs out, making it ideal for use when you’re at home or on the go. A POC runs on rechargeable battery or any AC or DC power source, so it can be used while traveling, and then recharged easily. It is also lightweight and easy to carry, making it superior to other portable oxygen solutions. Inogen’s portable oxygen solutions are engineered to provide you with the ability to get your oxygen anytime, anywhere. POC oxygen is infinite, pulled continuously from the atmosphere, so as long as your POC has power, you never run out. Using an Inogen portable oxygen machine for breathing comes with a variety of benefits, but one of the greatest benefits is freedom of mobility. Because the Inogen One POC is small, lightweight and easily portable, your oxygen therapy doesn’t have to hold you back. Inogen was founded on the belief that supplemental oxygen should improve your life, not impede it. Our Inogen One Systems help you reclaim your independence, allowing you to live a healthy and active lifestyle, even while receiving oxygen therapy. There are a number of types of oxygen therapy, each with different needs. We believe the Inogen One can provide you with the oxygen you need, without the heavy tanks, time constraints and refills you don’t. Talk to your doctor today and find out how an Inogen portable oxygen concentrator can help improve your quality of life, so you can breathe better and live the life you want.